Six San Diego State University faculty members recently received SDSU Alumni Distinguished Faculty Awards for outstanding contributions to the university and their respective fields. The honors were presented by SDSU President Adela de la Torre at the All-University Convocation on August, 23 2018. Thomas Rockwell is a professor in the Department of Geological Sciences in the College of Sciences, where he has been teaching since 1983. 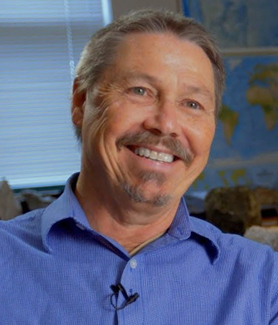 Rockwell is a widely quoted expert on earthquakes and tectonic activity in Southern California and has developed an internationally recognized research program. He is a member of the board of directors of the Southern California Earthquake Center and serves as an expert for local and global consulting companies on earthquake issues related to specific construction or modernization sites. He has drawn more than $4 million in research funding to SDSU.